Hello all. So this is the last post for a minute. We have the wedding then the Thailand. See you on the flip side. We finally did it ... we went to the new Brooklyn Trader Joe's. And I'm not sure I'll be back. Well, maybe. After buying their Bulgogi cuts from the meat section, I might go back for that. But ONLY that. The rest of the place is a madhouse and it's all gross. 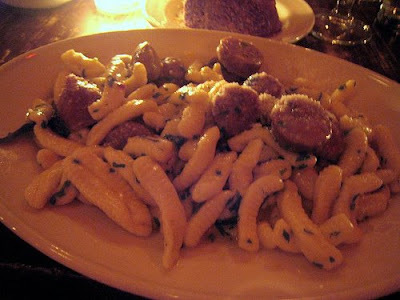 But last night, after chillin' at the Antic on Atlantic, we hit Joe's and picked up a few things. It was nuts, so we just grabbed a few essentials (you know, bulgogi beef, boston lettuce, the usual) and got out as quickly as possible. When we got home, we threw the bulgogi cuts on a pan, seared them up quickly and threw them on a plate after running a knife through it all a couple times. I also filled up a ramekin with some kimchee and cleaned a boston lettuce and we were in business. Lettuce wraps with bulgogi beef. With a bit of hot sauce, I must say, this was fantastic. The marinade for the beef was pretty awesome because the cuts were super tender and packed with good bbq and sesame flavor. Kimchee, beef, hot sauce and chutney. Man. That's Sunday night done right. Saturday Dan came by to help Meena plow though a few wedding things and just generally make us both feel better about all things wedding related. Dan has that way with us. So after a few drinks and much conversation, we ran out to Frankie's 457 for a bit of pasta and a whole host of other nice things. While we were waiting for a seat, we got started with something I'd never experienced before - hot buttered rum. And it's just what you'd think it is if you've never had it. It's butter, spiced aplenty, water and rum. And it tastes like fall in a cup. Much like spiced cider, but this is somehow even better. Maybe because it has rum in it. But it was pretty awesome. Really delicious. All of it. The meatballs were weird as an appetizer, but to be honest, when it all came to the table, it seemed very right. Very, very right. I mean, I had a bite of Dan's and it was awesome. No doubt. But the pork ... wow. It's just amazing. Every time. With the sauce, it's just another level of delicious. The meat just falls apart. And the subtle cheese is just right with the meat and the sauce. It's pretty much one of the best things on a menu in this neighborhood. Just saying. So it was a great night. Back yard dining at a great spot with great friends. Can't ask for much more. Note: Stole these photos from flickr. From scaredey cat ... who I have stolen from before. Thanks Cat! Meena needed to get her hair cut downtown on Friday so after a long night at the office, I rolled down to meet her for some trendy (but quite good) food at Bacaro. We were right in the thick of things. We were hoping for a nice spot downstairs, but we were dealt a spot right next to the door. So there was some commotion. But it was nice. It was sorta fun to be right there in the middle of all the too-cool-for-school comings and goings. The food was really lovely. 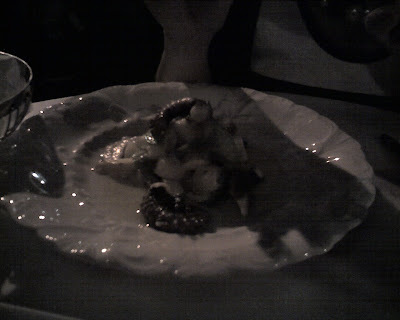 The octopus salad was exploding with garlic and really well done. Sweet, delicate octopus was the name of the game, not chewy, gross stuff. The meatballs were OK. I was looking forward to them and they weren't as special as I had hoped they would be. The main courses were awesome. 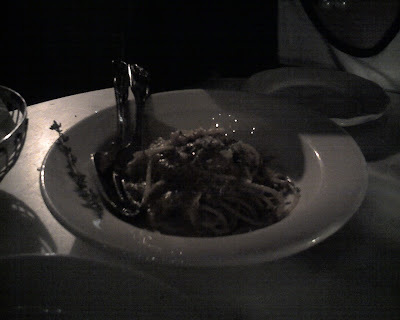 The duck ragu was beautiful. Lots of duck cooked down to its essence and thrown with some whole wheat pasta cooked to a perfect al dente. The beef stew stole the show though. It wasn't so much beef stew in the traditional sense. It was just bits of slow cooked stew meat piled high over a really rich bed of creamy polenta. Not something I would normally gravitate to, but man, I'm glad I did. It was perfect. So Bacaro was pretty rad. I'd a) recommend it and b) go back again. I don't have any more jokes. No defense. 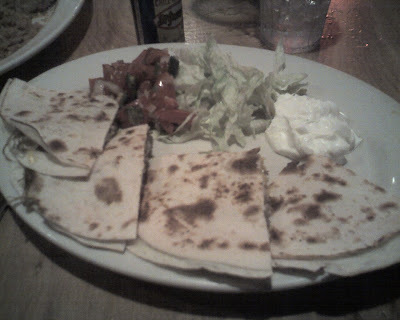 I just love cheap Tex Mex when the world is stressing me out! And my wife-to-be feels the same way. So anyay, we went to Lobo again last night and we were treated to more of the same lovely grub that we could probably make at home but don't because it's pretty darn cheap and they have better chips and salsa. Although we got a WHOLE garlic clove in the bowl last night which was weird. But whatever. I still love you Lobo. As Cleveland says, "We good though, Lobo!" Hot spicy and probably not the best thing for either of us. But man, with all the crap we've been dealing with at work and throughout the planning process, we just needed it. So we did it. And we're feeling pretty good about it. I guess it's been nearly two years since we started this thing and if you've read it a little over that time, you know Indian delivery has long been a part of our lives. 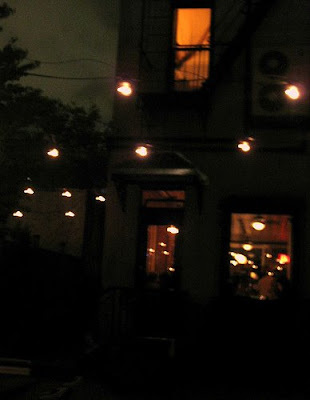 When we lived in the East Village, I think we were reeling in some Baluchi's nearly once a week. It was just so good we couldn't help it! But since we've been in Brooklyn, I'd say we've probably had Indian maybe ... four or five times? Tops? And maybe only twice was that delivery? We just haven't found anything we like that much. Last night Meena tried to alter this course and called in some delights from Raga on Smith. We hadn't had it in a long time and honestly, it had just been too long. So when I got home and heard this is what we had in store, I was pretty stoked. Not bad. Not bad at all. We each had a little naan with our dishes and that was one of the only sorta unfortunate parts. Not great naan. Not terrible. Not great though. The food was pretty solid. My lamb was like a spicy, liquid fire. Just the way I like it. Meena enjoyed her tika - I think she still loves Baluchi's a lot more. Can't argue there. But it was a pretty solid Indian delivery and we're both really happy to have it back in our lives. It's such a ridiculous thought when I see it in writing ... but so true. We're getting close. Things are coming together. It feels good. What doesn't feel good is getting home from work around 8:30. But that was my reality last night and although I said I was going to be better at the blog this week, I didn't promise cooking. Sorry. You might not see much in the homemade department for a minute. Actually, that was a total departure for her. But it was still ... simple I guess. It was delicious, actually. I got totally standard rolls but they were great. The scallion was balanced nicely with the yellowtail. Sometimes I feel like one is much greater than the other and this one was pretty equal. The salmon and avocado was HUGE and plump. So I felt pretty good about all the foods last night. Very enjoyable.